Mindset and Body Clock Reset ANTI AGING Program. The greatest medical breakthrough in recent years isn’t the creation of a new drug or treatment—it’s the re-discovery of how much your mindset affects your aging and health. Step One. Entering into a deep state of meditation and mindfulness. Preparing the brain to retrain itself. a) Guided Meditation provides you the key to reach deep levels of meditation quickly and easily. Optional biofeedback technology ( eg; Muse) can also act as your personal Meditative Guide. The technology guides you to quickly enter into a deep meditative state and provides feedback that helps you track your progress, keep consistent, and stay engaged. b) You then select a specific change goal you wish to obtain. Step Two. The Coaching Process. 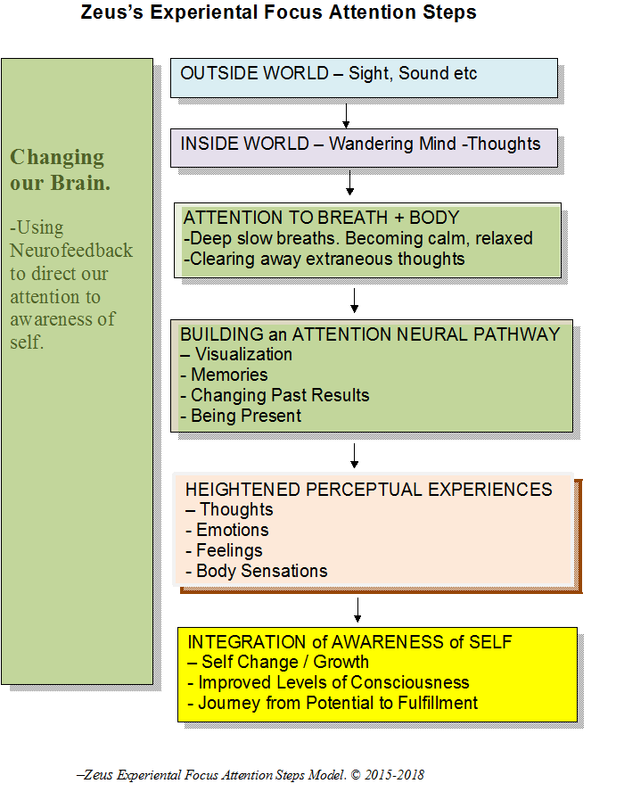 Using Self Transformation Model of Change you are guided through the steps and then taught how to self-coach yourself. After the session, clients typically report feeling refreshed, relaxed, and in a higher state of mental alertness and flow. Many sleep better and more deeply that very night! Step Three. Measurement and Lasting Change. You review your data and confirm the levels of progress and overall results. With continued practice, the brain quickly begins to 'figure it out' and learns to produce the desired brain wave patterns outside of the practice/exercise session. Research indicates that these gains are maintained long after the short, accelerated coaching program is completed although some 'refresher', self-coaching sessions may be necessary. The client reviews their set goals, and builds a deeply rewarding self-development, self-coaching practice that gets better every time. 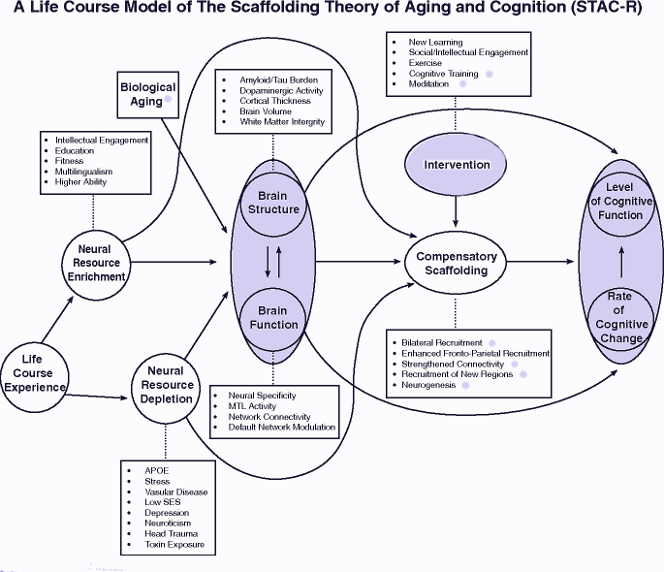 -Coaching Process to direct our attention to awareness of SELF and Training the Brain / Establishing a New Mind-Set to generate Change in Health and Age. The topic of self care and anti-aging is so critical today because we can no longer sacrifice our well being and very existence for everything and everyone else. Yes, there is much to do in our day-to-day lives and many people and things to consider. But, you are no good at getting any of these tasks done if your body age clock is running down and you are dealing with failing health (mental and/or physical) or just simple over tiredness. I’ve come across many clients who finally come in for treatment after their bodies have been screaming at them for attention for many months or years. This usually tells me that they’ve tied themselves to a tread mill as their life flashes quickly by. This is not what anyone deserves. We are all worthy of more. Our mortal life is short enough as it is. Today, we all have choices to extend the quality and length of our life. It all starts with awareness and the realization that you are worthy of self care and need it! Yes, you can find the small amount of time for a pit stop to re-fuel and replenish what you need for the longer journey! Remember, in order to be strong for others you have to first be strong for yourself. Self care is the anti-aging agent remedy you've been looking for. It's the antidote to a healthier, stronger, vital life and it's sustainable. It's absolutely necessary, it's essential and it's time you actioned it. The Neuro Enhanced Coaching Process provides a number of benefits for individuals who wish to pursue peak performance training in a relatively short period of time. Neurocoaching is used to enhance a person’s mental abilities and allow them to continue to raise the limits of their performance. Brainwaves in proper function work in a steady harmonic beat. Neurocoaching restores and strengthens this natural symphony. Neurocoaching provides you with the tools to train and exercise neural-nets in the same way as one exercises and builds muscles. 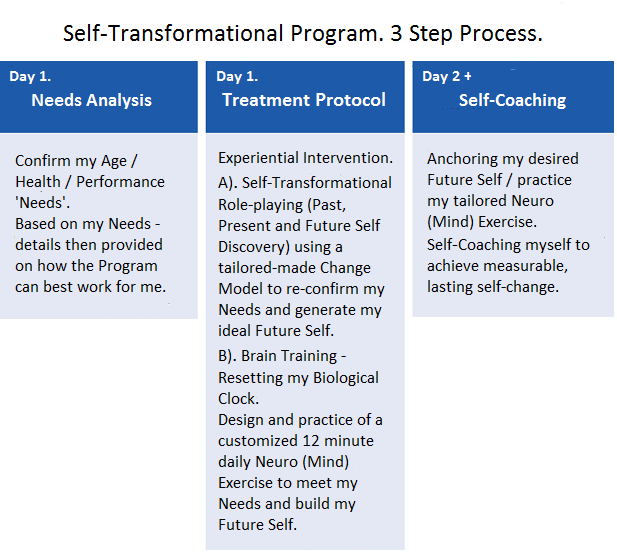 The Self Transformational Program makes more efficient use of brain resources by strengthening specific neural connections. Read More..